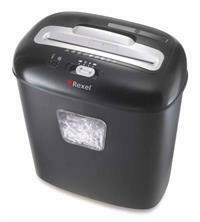 The stylish Rexel DUO Cross-Cut Shredder is intended for individual use either in the home or small office. It will handle up to 10 sheets of 80gsm paper at a time (or 11 sheets of 70gsm) and shreds paper into particles measuring 4 x 45mm. This gives it a P-3 security rating, meaning it can be used for the shredding of confidential documents and information. CDs can be shredded via a separate shredding slot that also has its own bin to keep the CD waste separate from paper waste - great for recycling. The machine will also handle credit cards, staples and paperclips. The 17 litre lift-off bin will hold up to 100 shredded sheets - and it also has a handy viewing window so you can see when it is getting full. Paper entry width on the shredder is 220mm, suitable for A4 paper shredding. Warranty on the Rexel DUO Cross-Cut Shredder is 2 years.